Mathematician Professor Andrew Martin has just solved the world’s greatest mathematical puzzle, and millions of miles across the Universe, alien species the Vonnadorians can’t risk the humans advancing in this way. A Vonnadorian is sent to Earth with the task of destroying any evidence of Professor Martin’s work – including those that the professor may have told about his discovery. Trapped in the body of Andrew Martin, the unnamed Vonnadorian navigates his way around a world that is frightening, confusing, and vastly different from his own. At first, humans disgust him; he’s always believed them to be greedy and violent. But the longer he’s on the planet, he starts to learn more about the human race and realises the beauty of life, in spite of its ‘flaws’. The first few chapters of the novel see the narrator attempt to navigate Earth and struggle to adjust. These sections are humorous as he tries to master such things as the language, nuances, metaphor, the importance we place on appearance, how we sometimes say things we don’t mean. As the novel progresses, and the Vonnadorian becomes more accustomed to the world he is staying on and learns more about humans, the novel highlights the things we know about ourselves as the human race, but don’t always acknowledge. The alien’s truthful insights into our lives and what being human means would feel insincere if they weren’t spoken by someone who is new to this planet, but they are honest and sincere, showing that sometimes you need to be an outsider to see these truths. It is these insights and wonderful observations which, though at times feel secondary to the plot, are what remind you why it’s beautiful to be human. As ‘Professor Martin’ grows closer to his human family, he begins to contemplate what love means, and these sections are endearing and touching. This is a tender, heartfelt, and earnest novel, which left me appreciating being human. It’s sentimental – particularly the belief that “love conquers all” – but the fact that this seems to work is a sign of the strength of the novel. One of my favourite chapters is simply a list of advice for a human, and while it’s sentimental, it’s uplifting and touching. I can’t write about this book without mentioning Haig’s note at the end of the novel, where he talks about what caused him to write it. He had the idea when he was ‘in the grips of panic disorder’ where ‘human life felt as strange for [him] as it does for the unnamed narrator’. While reading the book, I often took it at face value – an alien has come to Earth with a mission – but looking at it from the point of view of someone who feels distant, separate from everyone else on the planet, it felt very true. Haig writes that he was writing the novel for himself when he was suffering from a panic disorder or someone going through the same thing, ‘trying to offer a map, but also to cheer that someone up.’ I see this being the case for many reading the novel – whether they are currently suffering or have previously suffered from a panic disorder, or not at all – reminding us all of the hope and beauty in the world, and in being human. The Vonnadorian may be an alien, but he represents us all at some point in our lives. This is a heartfelt and thought-provoking novel which explores what it means to be a human. While reading, I feel you learn more about yourself than you do the characters, with the chapters reminding you why it’s a privilege to be a human and to be alive. 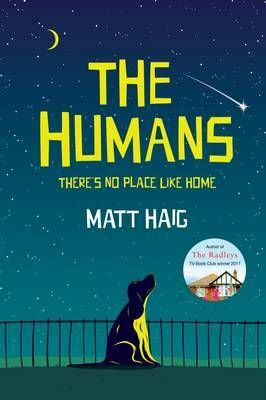 According to Matt Haig’s website, he is currently writing the screenplay for a film version of the book – I’m looking forward to seeing how they bring the book to life on screen.